This quilt has a secret. I'd intended to make a game of it, but someone spilled the beans on Flickr. I might actually be ready to do some circles now. This quilt is 'White Librarian.' It's based off of a redpepperquilts design (Bricks and Stones) I purchased a while back. 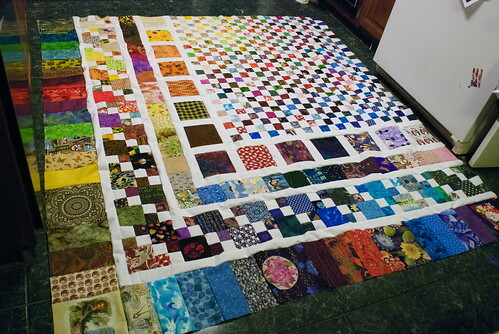 The original was only a lap-sized quilt, and I wanted something bigger. Bolder. I decided I wanted to make a new bedspread out of it, so I took the general idea of the design and scaled it up. I had to add an extra row, and I scaled up the size in a few places, but it's very obviously based on her design. 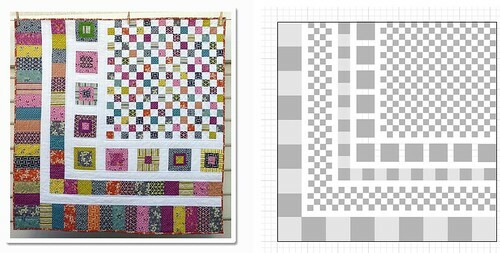 The smallest squares in this quilt are 2.5" unfinished, or 2" finished. Take those out of the equation. Every square bigger than that square in this quilt top is unique. Yes -- every single one. Go ahead, look for duplicates; there aren't any. (There are two purple batiks that look similar from a distance, but in person you can see they are different.) 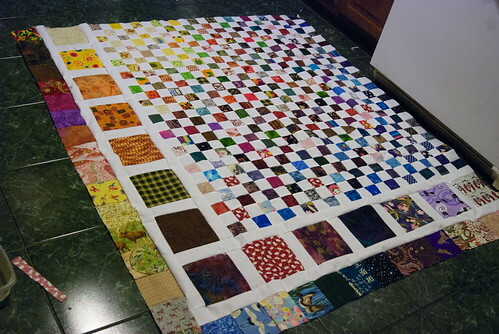 I cut into virtually every piece of fabric I had, including my scraps, to get all the pieces needed for this quilt. 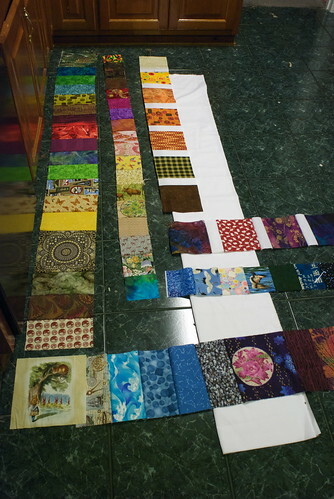 I did a rough sorting of the fabrics into warm and cool tones, but did not fully adhere to the division in all places. I wanted the three corners to be anchored by big, bold squares. The top left is a green Japanese temple scene Alice got for me, bottom left is the Tenniel illustration of Alice and the Cheshire Cat from Alice in Wonderland, and the bottom right is a large Japanese fan print I picked up in Hawaii. This quilt stays with me. There are small moments of delight all over this quilt. 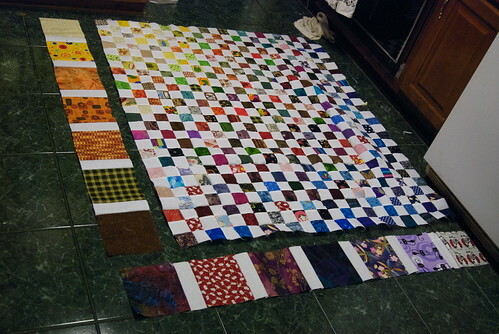 I cut into fabrics given to me by friends, and fabrics I bought on trips. I fussy-cut into the beautiful silk jacquard flower fabric I got in San Francisco. There is a moose. Lucky cats. Butterflies. Owls. It contains fabric from nearly every quilt I've ever done, and if I had a fabric in my stash that I thought too beautiful to cut, I cut generously from it. I will quilt this one myself, but there's a quilt or two ahead of it in line. Plus - call me selfish - I want to be more practiced before I attempt to quilt this one. I want to be able to finish it with the same level of precision and care that went into the making of the top. Can I quilt like you when I grow up? This is truly amazing! It almost makes me want to take up quilting! As a fellow crafter, I know we hardly ever keep any of our creations, let alone make something especially for ourselves, so I am in awe of you, I applaud you for making this beautiful gift for you! That is beautiful - it looks like someone took splatters of colors and pixeled them out over a white page :) There is obviously a lot of joy in that quilt. That quilt makes me very happy to look at. I love all the juicy, vibrant colors and I wish I could see all the detail up close. I know you'll spend many happy hours under it. Can't wait to see it all finished. I totally understand waiting to quilt it as I have been postponing one for quite a while until I get more practice under my belt. I love, love, love this quilt!! I found this on Flickr and had to come over here to tell you. I am already compling fabric to make my own. I love the color placement on this. And I adore the off-center placement of the blocks. Great Work!